I was lucky enough to get good weather to go fishing some last week. I cant remember all my groups names but the fishing was very strong. I started out on friday with a hot spot that was no longer hot. 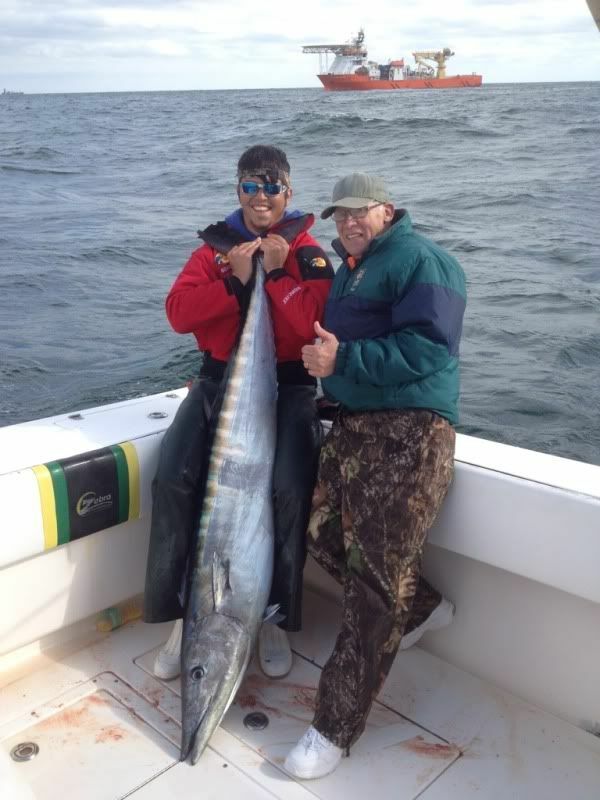 We worked around and picked up some blackfin on the troll before we doubled up on wahoo and got one. 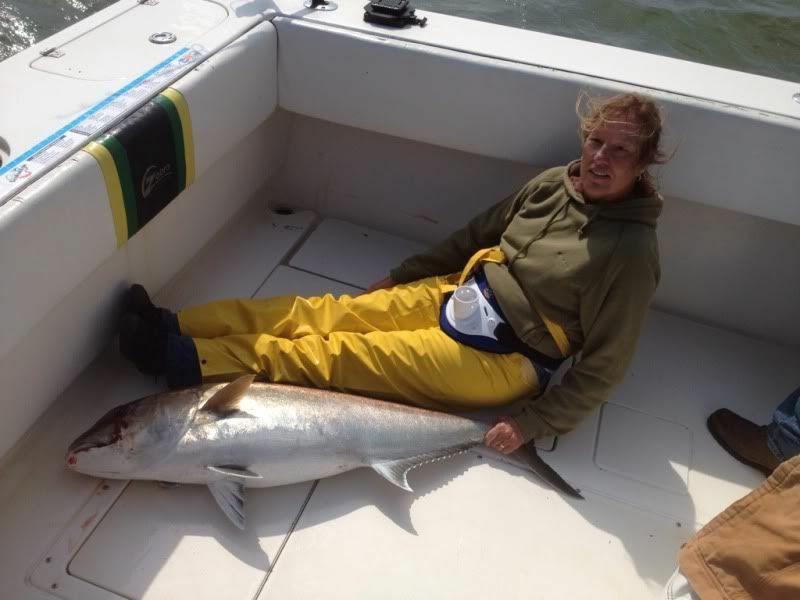 No more bites at that spot so we moved inside a little bit and jigged up a limit of amberjack on my new talica 16 which is an awesome jigging reel. 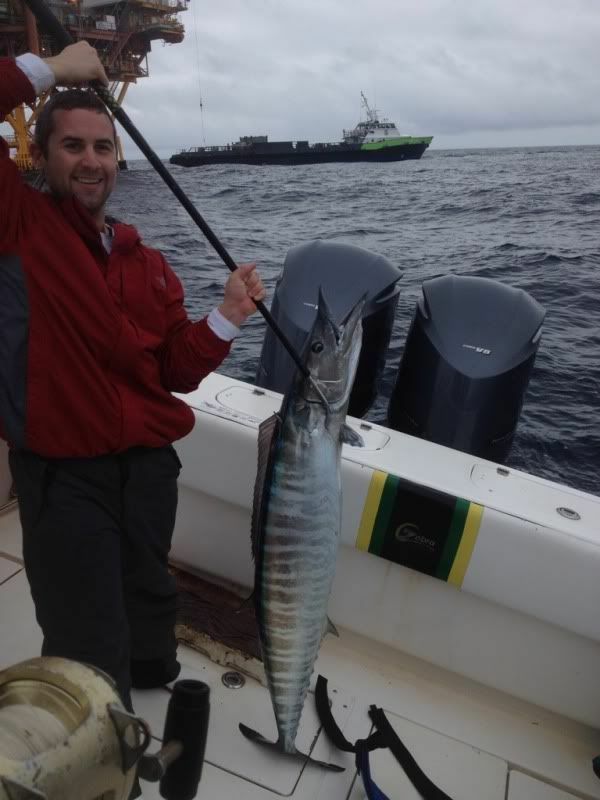 We picked up another wahoo at the next spot before we made it over to our sweet spot. 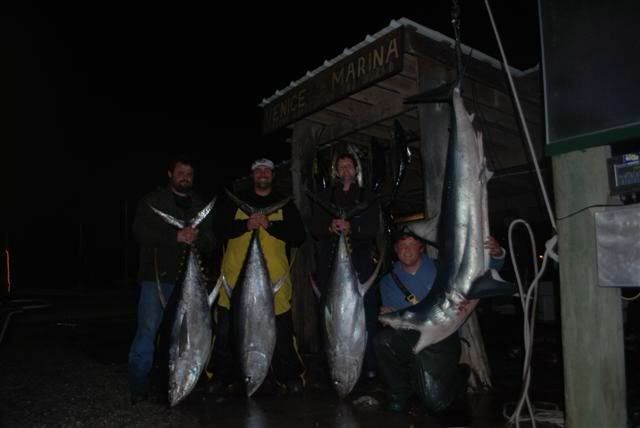 We snagged a triple header on wahoo and made it out with two of them and picked up a half dozen jumbo blackfins on the troll. I went back out sat with the hopes of finding some fish but it was like a light switch and every where I went was dead and we ended up with a grand total of 4 blackfin for the day. No wahoo bites whatsoever. Took off a day for weather then went back out Monday with Judy and her husband. 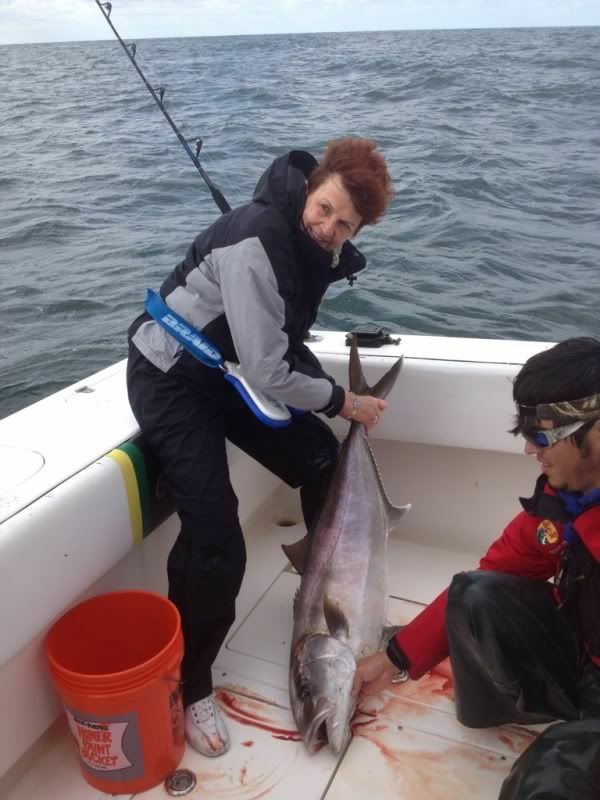 We picked up one blackfin at our first stop but that was it. Hit a few more rigs with no luck before we made it over to the ole lump. 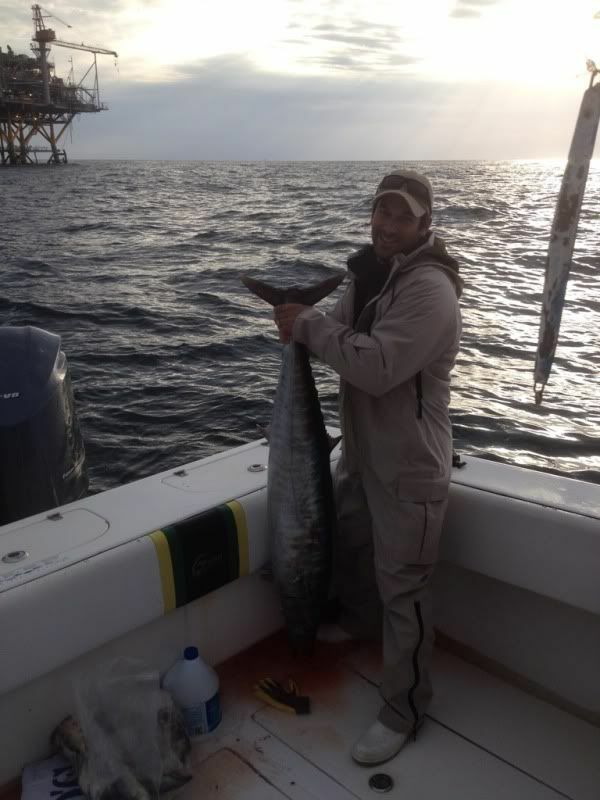 First pass on the rig yielded a 91 pound wahoo in the box. Next pass was an amberjack. 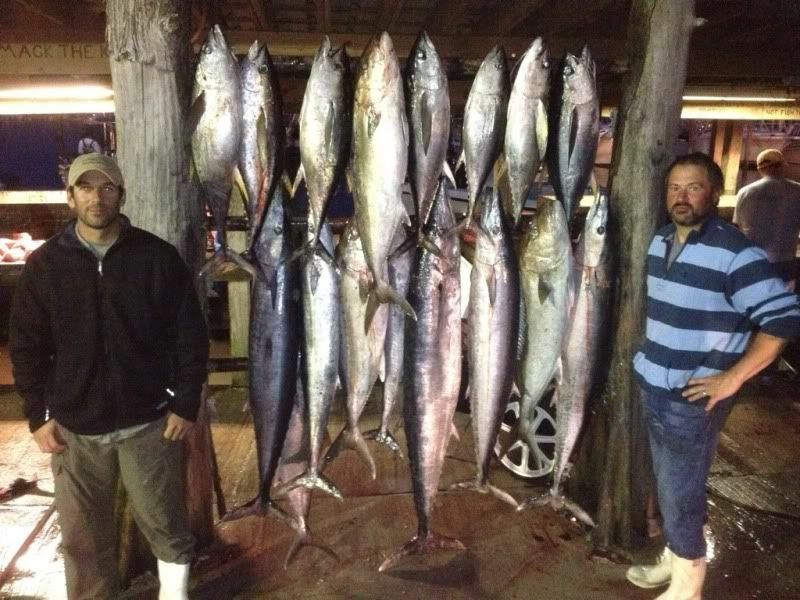 After that we got a few blackfin and one more wahoo before the bite stopped. 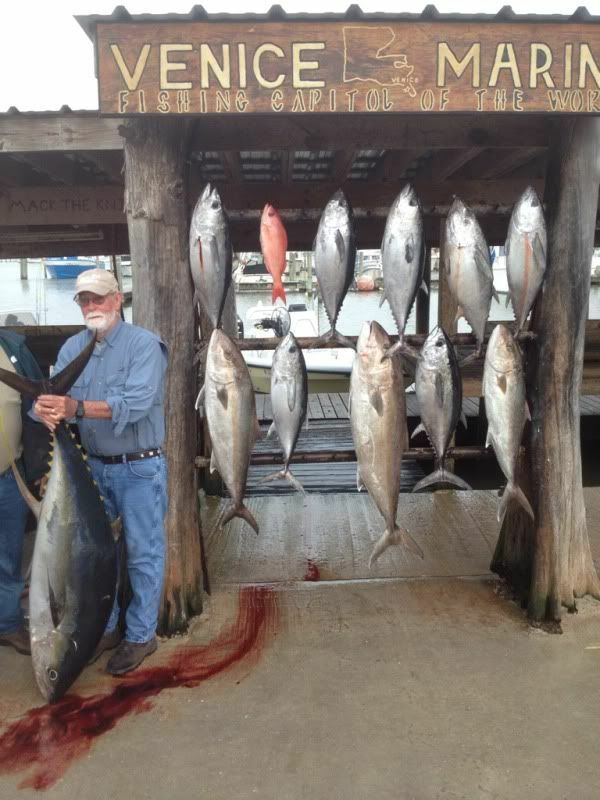 We went over and started chunking and immediately started getting blackfin in the slick. 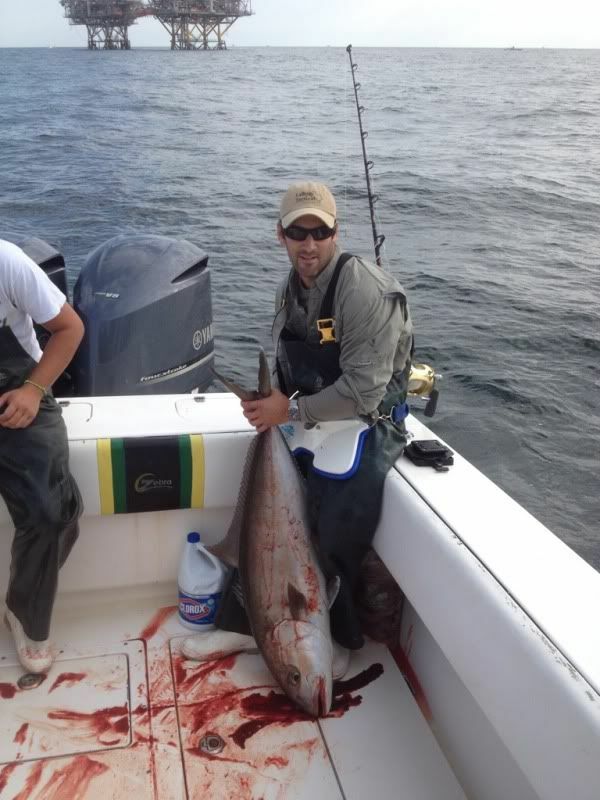 We popped a few of those in the boat quickly along with two small yellowfin before the sharks got too bad. Tuesday I had my good friend Paul and his neighbor on the boat with me. 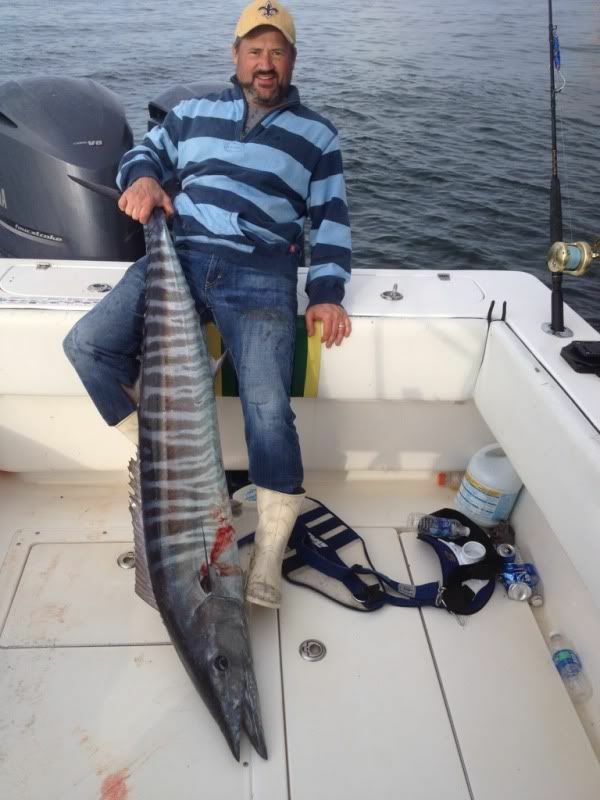 The wahoo bite was definitly on as we put 5 in the boat quickly including a fully successful triple header. We tried the lump again with no love before I headed south looking for tuna. First pass by the rig we doubled up on 30 pound yf on the troll. After that we got one more on the troll before they moved a little deeper. I Started chunking and we caught two more that way on 7/0 hooks and 60 pound frenzy flouro leader. Right before we left they started popping and Paul landed two on frenzy poppers. Made one more stop at the first rig on the way in and got a bonus 70 pound wahoo to end the day. Wed was a day off before we got back out to hit thursday. I had a group in from georgia that wanted some big fish and they got it. 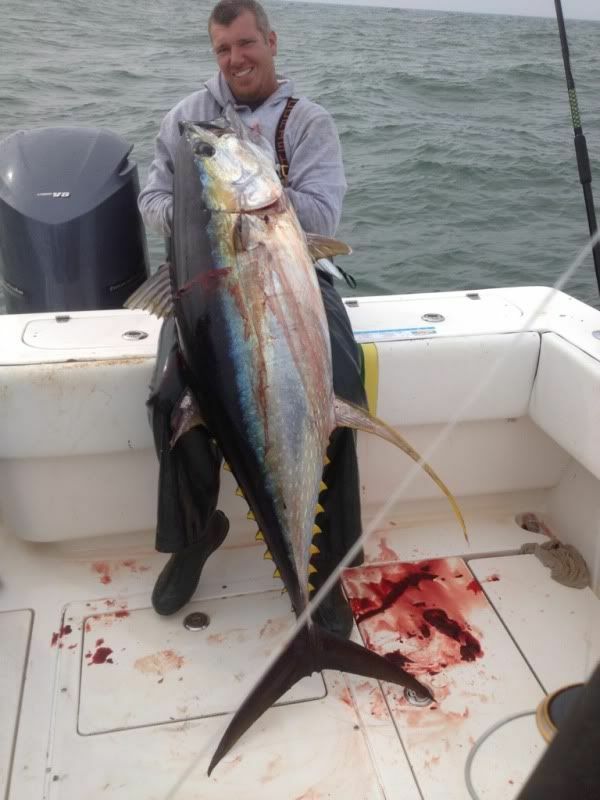 We jigged up a couple blackfin early before we got to work on the ajs and put our limit of ajs in the boat with live hardtails. First time in a while Ive struggled to jig up my ajs. 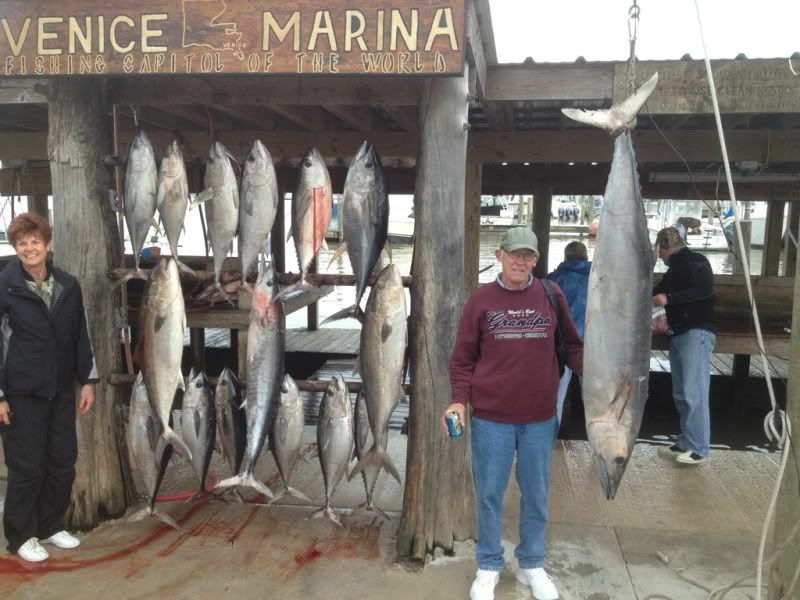 We headed out to make some tuna drifts and it was slow to start before Josh Howard started picking away at blackfins and told me to come over by him. We all picked at the blackfins before a few yf showed up. We had a screaming hit on a 50 and I knew it was a yf. All the guys were tuckered out so halfway through the fight they put me on it and I hammered down on the fish and put a 132 in the boat. I had Michael Pittman run a private boat for me and he had a stellar day as well as he ended up with three good yf and a mako.